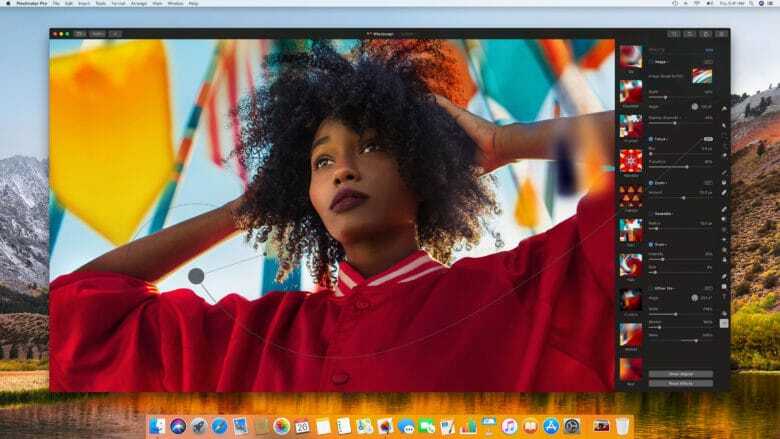 Pixelmator made a name for itself by becoming a powerful and highly-polished alternative to other well-established photo and image editing suites. What makes Pixelmator special is that it competes with Photoshop on features, but sells for a lot less. Pixelmator Pro for macOS is a little more advanced than the standard Pixelmator release, and with every major update, it just keeps getting better. Here’s what you can expect from version 1.3. The new features are particularly useful for illustrators and designers who are building images from scratch. You can use clipping masks to quickly clip the contents of one layer to the outline of another — even layer groups or nested shapes. Clipping masks can be added from the shortcut menu in the Layers sidebar, simply by option-clicking between two layers. You can release a clipping mask by double-clicking the arrow in the same sidebar. Pixelmator now lets you color tag layers so that they’re easier to find and navigate, too. This helps you more easily find images, text, shapes, and more — and it means that when you open Photoshop documents with color tags, they can now be saved. Another new feature in version 1.3 is the ability to apply color adjustments to shapes, and options to quickly adjust layer opacity and blending mode from within the Layers sidebar. You can find the complete release notes for version Pixelmator Pro 1.3 in the Mac App Store, where it’s available to download now. It’s a free update for existing owners, or a $39.99 purchase for new users.